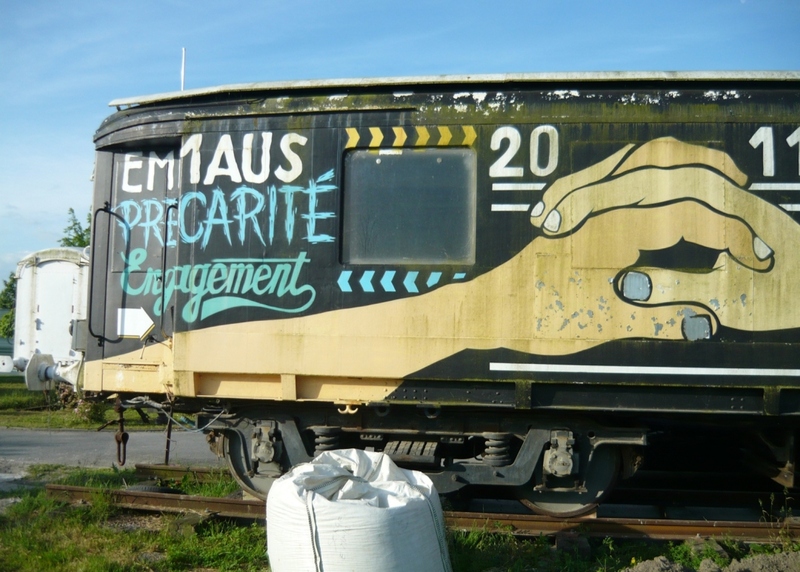 The alternative Lescar-Pau Emmaus Village was conceived as a collective adventure, a political project, a occasion to experiment new ways of sharing, working and living together in the service of resourceless people. Anyone – men, women or families – needing a job or a place to live can stay for as long as necessary. The project of the Lescar-Pau Emmaus Village is developed through its main activity: waste recycling. The opening of the village to the general public is one of its missions. Every year thousands of people come to the retail space to buy donated goods that have been restored by the companions, visit the village or the grocery store, attend the music festival or discover the educational farm and get acquainted with the local species of plants and animals. The Lescar-Pau Emmaus Village is first a place to live where men, women and children build their own future and life project. On arrival, all companions get a room of his/her own in one of the houses. Then after a few months, if they really want to settle and according to availability, they can have access to a mobile home or an echo-habitat house in the Quartier d’Ossau. This allows a progressive settling and the gradual development of confidence as citizens. Germain Sarhy founded this community in 1982 with the help of Abbé Pierre. He is a writer and fervent defender of anticapitalism. He is also been mayor and companion of the village since its creation in 1982. 130 people with different status share the experience of community life: companions, employees, volunteers and trainees. The companions – men and women – live in the village and are involved in various group activities: waste recycling and sorting, object selling, eco-construction workshop, repair workshop (home appliances, luminaires, electronics), mechanic workshop, village maintenance, gardening, supervision of the vegetable garden and of the alternative farm. Companions represent 90 % of the Lescar-Pau Emmaus Village. Some live with a partner, others on their own or with their family. In exchange for room and board they have to respect the basic rules of community life, practise activities according to their physical and moral capacities, and accept the internal rules and regulations of the village. They are free to come and stay as long as they want. Eco-habitat offers them the possibility to build their own house/future. Employees do not live in the Lescar-Pau Emmaus Village but come in to work for the collective project. As all the other members they have to respect the rules for life and work in the village as well as its values. The volunteers, according to their ability, join the community to share experiences and knowledge with the inhabitants of the Lescar-Pau Emmaus. If the word “design” is not used by the founder of the project or by the Village residents, the creativity of the inhabitants is mobilized for a common project: organization of living spaces, collecting and recycling objects, self-build housing, project managing, etc.